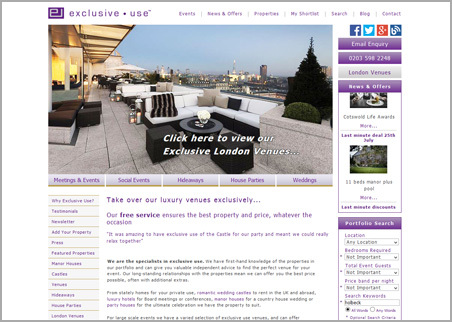 Exclusive Use organise hire of entire luxury venues such as hotels and other premier properties using their bespoke backend system. The website includes various bespoke functionality such a property 'short-list' facility using which visitors are able to view their favourites list from any device. The web site includes a bespoke backend system enabling the addition of properties and their attributes including multiple images and maps. Property and banner images uploaded for pages are automatically cropped and resized, with optional overlay text. The website handles multiple property categories which store and display different information and in a different order according to a property's status. The client has the facility to publish regular blogs using a built in blog section. The backend also serves as a marketing database using which marketing contacts are stored and extracted with a comprehensive filtering system.